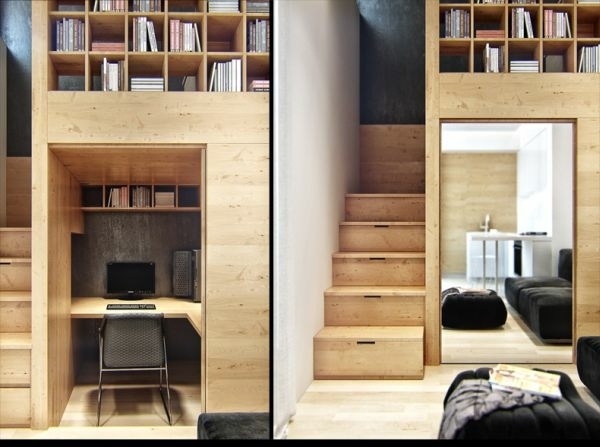 Small apartments have a special charm, which is achieved by a proper planning, a space-saving design and some creativity. Sometimes see studios even cozier than large apartments from which many separate rooms. However, those who set up small apartments must, should try going to get the most out of the small space available. 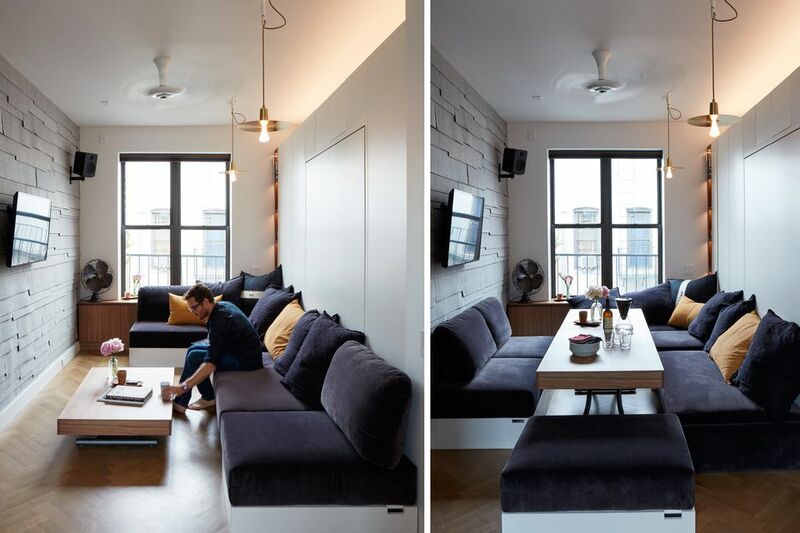 In this article we would like to show you the interior architecture of four small apartments, which have an area of less than 50 square meters, but are functional and cleverly designed. 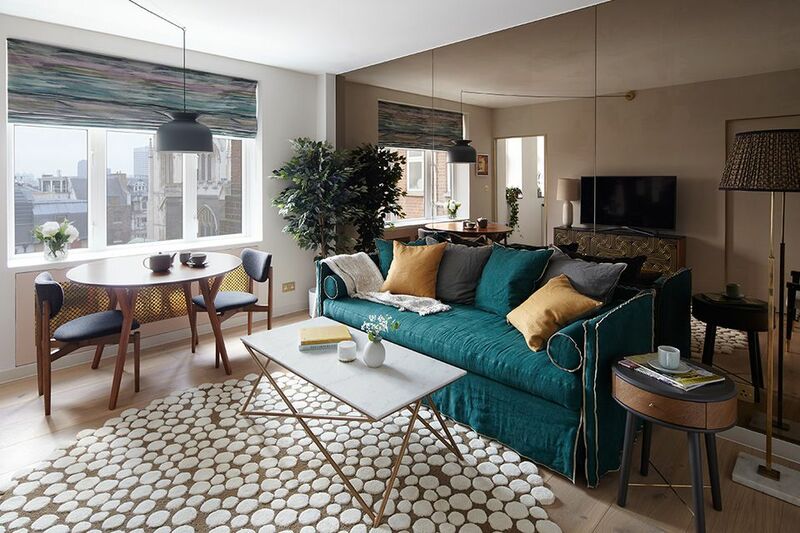 This one-bedroom apartment has a floor area of only 20 square meters, which is arranged in an optimal way to satisfy the needs of a young couple. The designers Piotr Matuszek and Gosia Czarny have transformed the small space into a cozy apartment that impresses with its space-saving design. To make the small space look bigger, the designers have selected bright colors for the decor and clean lines with a simple geometric pattern for the wall design. 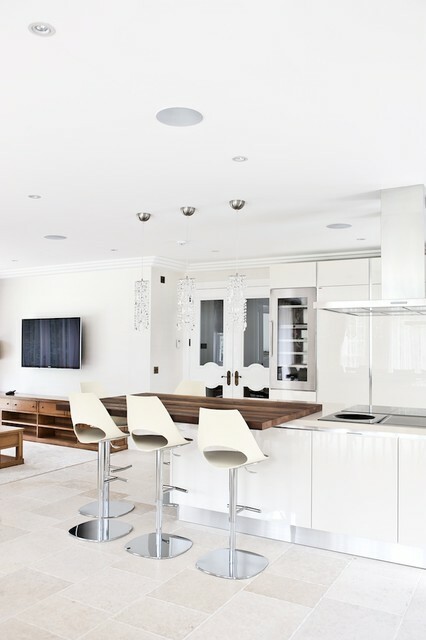 The shiny white wall panels and kitchen frontages reflect the daylight and create an elegant bright interior. The selected furniture is modern and functional at the same time. The wardrobe bed, which is hidden behind the wall panel during the day, and a down-to-earth double bed can be lowered in the evening. The bathroom follows the color scheme of the living room, but is supplemented by a wider pattern and an orange color accent. Solo Design Studio was to set up a one-room apartment, with the owners wanting to have clearly defined living areas. The designers have managed to create a sleeping area, a kitchen and a living area on an area of ​​40 square meters. In doing so, they have used different accents for each area to determine the boundaries optically. For the sleeping area, which is additionally separated by a dark curtain from the rest of the apartment, bright tones and a turquoise color accent are selected. The pendulum lights and indirect lighting provide for more comfort and a relaxed atmosphere in this secluded area. If you want to set up small apartments, you should limit the furniture to simple and space-saving furniture that does not occupy too much space in the room. With this apartment, the designers have chosen a simple yet modern interior that fits perfectly in the room. While the color schemes in the living room and bedroom are lighter, the kitchen and dining areas have darker colors, which contrast the interior. The gray walls and the room divider in stone optics ensure more aesthetics in the small apartment. This small apartment is designed in an eclectic design style, which usually combines different styles balanced and refined. 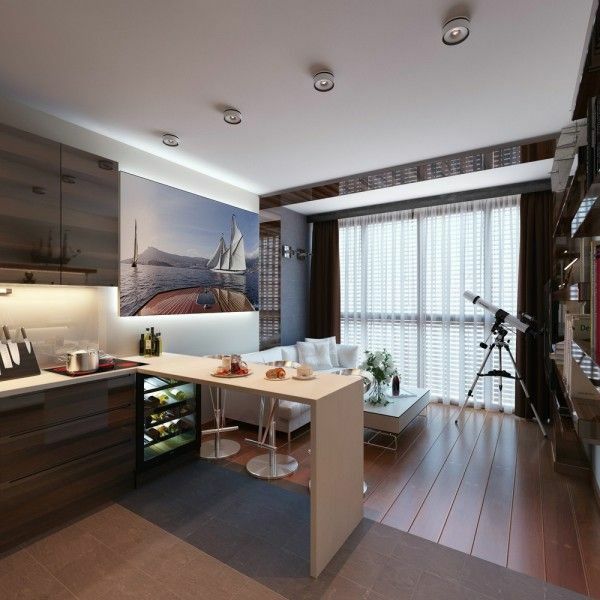 Thus, the Ukrainian architect Nastya Antonyuk succeeded in separating the different areas in the one-room apartment. The different colors in the interior designate the individual living areas and are supplemented by peppy accents in funny colors such as green, yellow and blue. The facility is a combination of antique and modern furniture, diverse structures and industrial lighting. The kitchen is designed in a niche and gives the small apartment a vintage flair. In the middle of the room is a matt room divider, which includes several important functions in one. On the one hand there are entertainment possibilities such as the TV and a built-in bookshelf, on the other hand the small bathroom is hidden behind the black wall. Furthermore, all the wall niches in the apartment are furnished in an optimal way and each fulfill a useful function in the interior. In the sleeping area, round forms are used as a decorative accent, which can be combined perfectly with the minimalist wardrobes and drawers. The designer Michael Temnikov has designed this loft apartment in a minimalist style by using simple geometric shapes and inexpensive materials. Concrete, wood and wire are combined in a tasteful way and provide a modern interior with a somewhat industrial flair. The sleeping area is designed in a wall niche saving space and separated by a curtain from the rest of the apartment. If you want to create small apartments where the space for decoration is not sufficient, you can consider a creative wall design. This loft apartment is designed with a vertical garden in the living area, which brings some green in the otherwise monochrome interior.